When it comes to safety on the water, next to your life jacket, nothing is more important than a fixed mount Very High Frequency (VHF) marine radio. Some seasoned sailors may even say that a marine radio is more important than your life jacket because it improves the chances of a rescue. If you spend a lot of time in your boat, then it is likely that you already know all this but how do you translate this knowledge into action? For example, do you pay special attention to the quality of your fixed mount VHF radio? Did you make sure that you have the best possible one for your boat? There are, after all, multiple options available online. The ICOM M506 is one of the better VHF marine radios out there. Why? We will go over all the reason why in this review. You wouldn’t buy an electronic product manufactured by a little known company located in a third world country, especially a product that your life may depend upon someday. You want only the best product manufactured by the best company. Well, ICOM is definitely one of the best. The ICOM M506 is manufactured by ICOM America which is a subsidiary of ICOM Incorporated. ICOM Inc. is a publicly listed company in Japan that traces its roots as far back as 1954. While ICOM began with a focus on providing equipment to the amateur radio industry, they have since made a name for themselves in professional-level communication equipment suited to marine, aviation, and land based vehicles. The ICOM M506 is one of the best options within its price bracket. 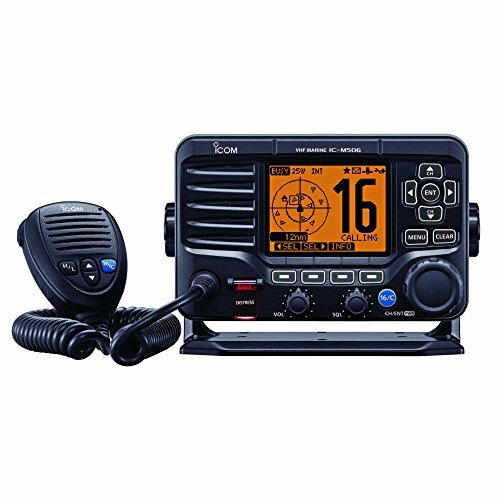 This fixed mount VHF radio isn't one of the best because of its exceptional technology but because it has a much more advanced feature set for the pice. The foremost of these is water resistance. While most marine radios are built to resist water, this fixed mount marine radio does it better than all of them. The water resistance rating of the M506 is IPX8 while its competitors can, at best, only offer IPX7. There’s even a special water resistance feature of the ICOM M506 known as the AquaQuake. The purpose of the AquaQuake feature is to drain the water out of the speakers so that its sound output doesn’t get garbled. Speaking of sound output, this fixed mount VHF radio’s output quality and volume is the best in the industry. Its audio output of 15W puts many of its competitors to shame. High sound output is important because it makes the transmission easier to hear even in conditions like engine noise and strong winds. With a higher sound output, transmissions will always be clear and you’ll never miss any crucial information. Another great aspect of this fixed mount marine radio is that it offers the option of establishing a second station on your boat. The second station can be established with the help of an add-on called COMMANDMIC. You can set up your second station as far as 60 feet from the main unit and it’ll give you access to all the functions too. Furthermore, it has a soft-key interface which should make it easier for you to use the device. If you do choose this add-on as you should, you should also know that you won’t have to worry about water affecting your second station. It has a water resistance rating of IPX7, which is only a single point below the main unit. The second station will allow you to forego a backup handheld VHF radio. Handheld VHF radios tend to have less power and low resistance to water. This is why the second station option is so great on the ICOM M506. Another unique feature that ICOM has provided in the M506 is last call recording. This functionality allows the last two minutes of your previous call being recorded automatically. However, you'll also have the option to manually record any call, if that is what you need. 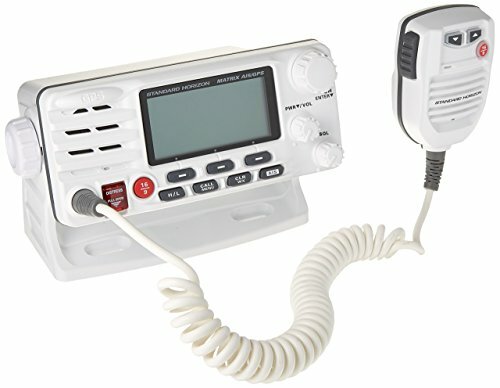 This fixed mount VHF radio is also more compact than many of its competitors. It measures about 4.5 inches in depth and height, while its width is approximately 7 inches. Its smaller size means that it won’t eat up a lot of space on your helm, which should open up options for other equipment, if required. An Integrated AIS Receiver: AIS stands for Automatic Identification System. It automatically transmits relevant information about your vessel like your position, your speed, and the direction you're moving in to others around you. The AIS receiver, on the other hand, translates incoming information about other vessels and presents it to you on a screen so you can plot your path safely and avoid collisions. The ICOM M506’s AIS receiver has three display settings – the Plotter, the Target List, and the Danger List. Two-Way Hailer: This fixed mount marine radio has a 25W two-way hailer. With this hailer, you'll be able to use your external hailer horn to communicate with people on other parts of your boat or even people on the shore. Active Noise Cancelling: The digital noise cancelling feature of this VHF marine radio reduces background noise by up to 90% on received signal and up to 30% on transmitted signal. This means clearer communication even in adverse conditions. Built-in Horn: The ICOM M506’s built-in horn, once connected to your external hailer horn, will give you access to four automatic horn patterns. You can, of course, use it manually too. Optional Scrambler: You’ll also have the option to get an add-on voice scrambler in case you want to prevent third-parties from listening in on your discussions. There isn't much wrong with the ICOM M506. It is a very solid device whose reliability ensures your safety in even extreme and adverse conditions. However, there is one flaw in the M506 that you need to consider very carefully before making the purchase decision. This is the fact that it doesn’t have built-in GPS. This could be a deal breaker for many people because GPS or NAV ensures that your emergency or DSC calls carry your position information for rescuers to zero in on. If you don’t ensure that your VHF radio has GPS support, going to regions with minimal traffic i.e. farther from the shore could be risky. Even so, the absence of an internal GPS module is balanced by the fact that ICOM has provided the option for an external GPS/NAV interface. So, the ICOM M506 you buy will be compatible with NMEA 2000 provided you get the latest version. Older variants will still allow external GPS module connection but only through NMEA 0183. This is probably why certain buyers have complained that this fixed mount marine radio works with a NMEA 0183 device but doesn’t support NMEA 2000. It is also possible that these individuals have been unable to set up their device properly which is why they're facing this problem. The company clearly advertises that the ICOM M506 supports NMEA 2000. We doubt they’d do that and risk lawsuits if the device didn’t support NMEA 2000. The direct competitor of the ICOM M506 is the Standard Horizon GX2200. Many people may be tempted to choose the Standard Horizon GX2200 simply because of its lower price bracket. However, when it comes to a VHF marine radio, the phrase “you get what you pay for” really does apply. The slightly reduced price of the Standard Horizon GX2200 is a result of the absence of some key features. 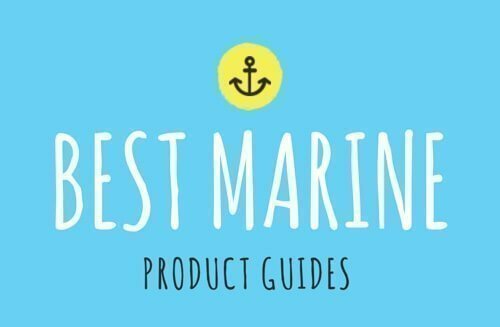 The foremost of these is the NMEA compatibility. The Standard Horizon GX2200 offers NMEA 0183 compatibility, while the ICOM M506 provides compatibility with NMEA 2000. If you know and understand marine radio electronics, you will know that NMEA 2000, or N2K as it is commonly known, is more advanced than NMEA 0183. In practice, this means that N2K devices tend to offer more versatility, greater integration with other devices, and a better network control. Moreover, N2K devices support multiple users while NMEA 0183 only supports one pair. There are multiple other areas where the Standard Horizon GX2200 falls short of the ICOM M506 as well. For example, it only offers an audio output of 4.5W while the ICOM M506 boasts of 15Watts of audio output. This means that its sound output is lower and may not be as audible on speaker as the M506’s. The GX2200 doesn’t even have AquaQuake or the last call recording function. Absence of AquaQuake means that its microphone offers reduced performance when being used in a lot of water. Not having the last call function takes away a clear convenience too. A much bigger limitation of the Standard Horizon GX2200 in comparison to the M506 is that it is only rated for IPX7 water resistance. When it comes to safety, even a single rating point can make a huge difference. Don’t you agree? There is one area where the Standard Horizon GX2200 does better than the ICOM M506, though – GPS. The GX2200 comes with an inbuilt 66 channel GPS component which can be vitally important. If you don’t already have a GPS or NAV system on your boat that you can connect to your fixed mount VHF radio, then you'll definitely want to go for the Standard Horizon GX2200. However, there is no fixed mount marine radio out there that offers a better feature set and real world performance than the ICOM M506.